The number of people enrolling on coding bootcamps is increasing. In 2018, for example, there was a 20% growth in US students graduating from online coding bootcamps. With this rise in demand for tech education, what bootcamp outcomes can prospective students expect? 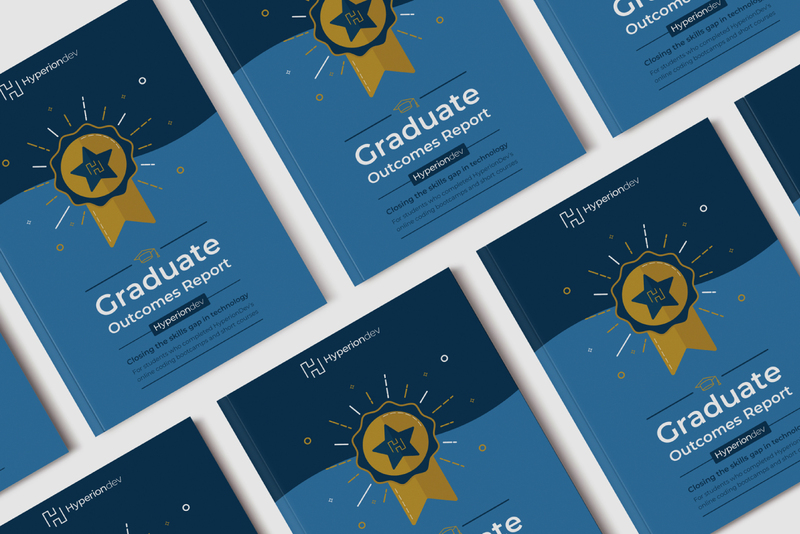 Let’s take a closer look at HyperionDev’s Graduate Outcomes Report for more insights. Students learn to master engineering in Python and Java, as well as the software development principles, data structures, science and algorithms needed to kick off a rewarding career as a software engineer. They also receive a solid foundation in data science and machine learning technology as they progress through the bootcamp. Students learn to harness the full power of Java and Android to leave their mark on this key industry. During the bootcamp, students study the essentials of probability and statistics for data analytics. You’ll also cover Python, Java, Object Oriented Programming, and machine learning, which is one way of achieving artificial intelligence. Machine learning brings together computers and statistics to build algorithms that allow computers to learn new tasks. It allows the computer to use experiences to learn by seeking statistical patterns in the data. What are the HyperionDev bootcamp outcomes? According to the results of a questionnaire sent to all graduates, 95% of graduates reached their career outcomes since graduating. These outcomes included moving to a new career in tech, starting their own business, upskilling in their current tech role or using their new skills in another job. However, most graduates ended up working in the tech industry. 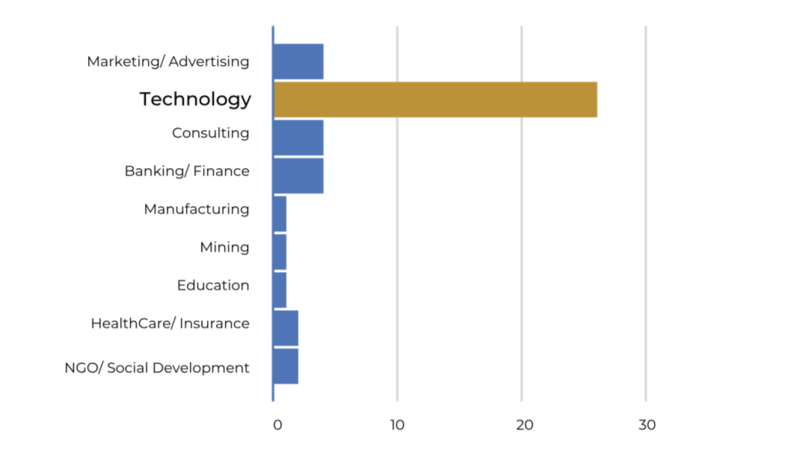 Here’s a graph showing the industries where graduates can be found – you can see that 72% are now working in tech fields, although a coding career prepares one for a wide variety of fields, from social development to mining. Once graduates completed their courses, their salaries, on average, increased by R12 000 per month, equating to an extra R144 000 per annum. That’s what happens in South Africa, but what happens elsewhere? Do bootcamps lead to salary increases? Before taking a bootcamp, Course Report found that students were, on average, earning $46,974 compared with $70,698 post-bootcamp. As graduates become more experienced developers, salaries continue rising even further. In their second jobs, bootcamp graduates earn around $80,000 per annum. And by their third jobs, they are earning, on average, $90,421 per year. 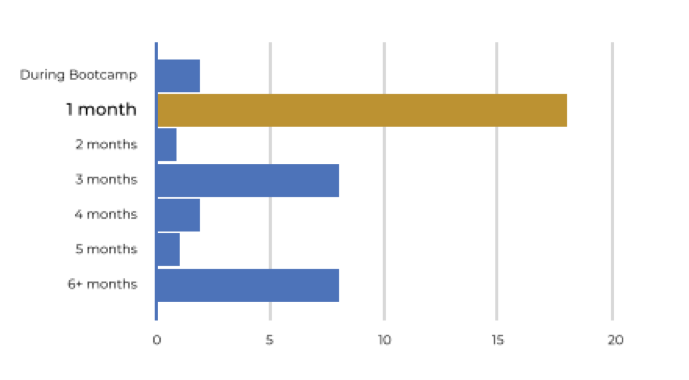 Here’s a graph depicting how long it took graduates to find a job after finishing their bootcamps – 72% who found a new tech job were employed three months after graduating. This indicates that the tech industry is satisfied with short course and online bootcamp qualifications. In conclusion, bootcamp outcomes from the Graduate Outcomes Report are highly positive and exciting. Not only are students able to find work in a variety of industries, though mostly in tech fields, they can expect a significant salary increase as well. If you’re keen to change careers or upskill, consider enrolling on a HyperionDev online bootcamp in Full Stack Web Development, Data Science or Software Engineering. You can also trial one of these courses for free. If online learning is not your thing, you could enrol for an immersive, face-to-face Web Developer or Software Engineering course in Cape Town or Johannesburg.